Endless turns of life take place in the kitchen. Much of our family life occurs around the table or somewhere between the kitchen sink and the stove, everyone’s spoon in the “broth” of the day-to-day rhythms. And I’m pretty sure many families find their own important work happens here, where we sustain ourselves body and soul. It’s in the kitchen that we model values around health, ecology, experimentation and respect. However, family functions best when important spaces include the whole group; the broth is sweetened by the flavor each of us brings to the moment, whether it’s our best self or not. Much is gained from everyone being able to participate in the real work that occurs in the kitchen. Peacefully including everyone, of course, presents challenges, but a little planning can prove the truth of the second adage. For the very youngest family members, they might just appreciate being in the mix of the effort. 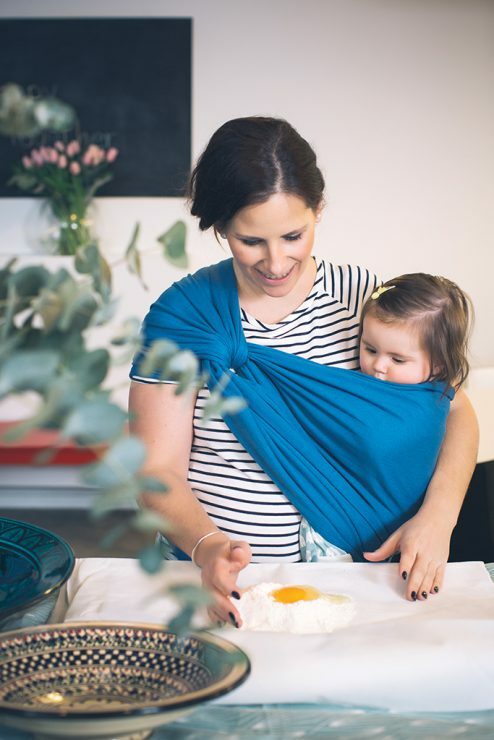 They can usually safely be in a baby carrier as the dishes are washed or the groceries are put away; for other tasks, maybe they can sit in a bouncer or high chair where they can see what’s going on but out of reach of the many hot or sharp things in the kitchen. Once they become toddlers, they are more likely to want a job during meal prep or other work. Perhaps they can dry the silverware, stow the kitchen towels, or wash the tomatoes. They can sprinkle the herbs in your recipe, tear the lettuce for salad, or take a turn at whisking egg whites. Having these very young helpers in the kitchen may feel like one too many things to juggle for a harried parent, but welcoming them at this age means they will be able and ready to help as their skills improve. Preschoolers can start doing some measuring, stirring and sifting. You will want to keep an eye on them as they’re learning, but you might be surprised at the skills they can start to master at this age. A four-year-old may enjoy the simple action of folding the kitchen towels or the bubbly work of washing their own dishes. They will enjoy learning how to use some of the simpler kitchen tools, like the juicer, egg beater, masher or manual grinder. In some families, children in this age range might start doing a bit of fruit cutting; you should use your best judgment and plenty of supervision as your child is learning knife skills. Clean up can become a larger part of your child’s routine starting around 3 or 4; they can help put away dishes or clear the table. They might be ready to do more of the dish drying or to use a little broom and dustpan. This group can plan a bit more so they might be interested in assisting with making a shopping list or meal plan. By the time your child is in first or second grade, you will have a good idea of what tasks they’re ready for. Some second graders can safely use the stove to boil an egg or flip pancakes; some are years away from that responsibility. 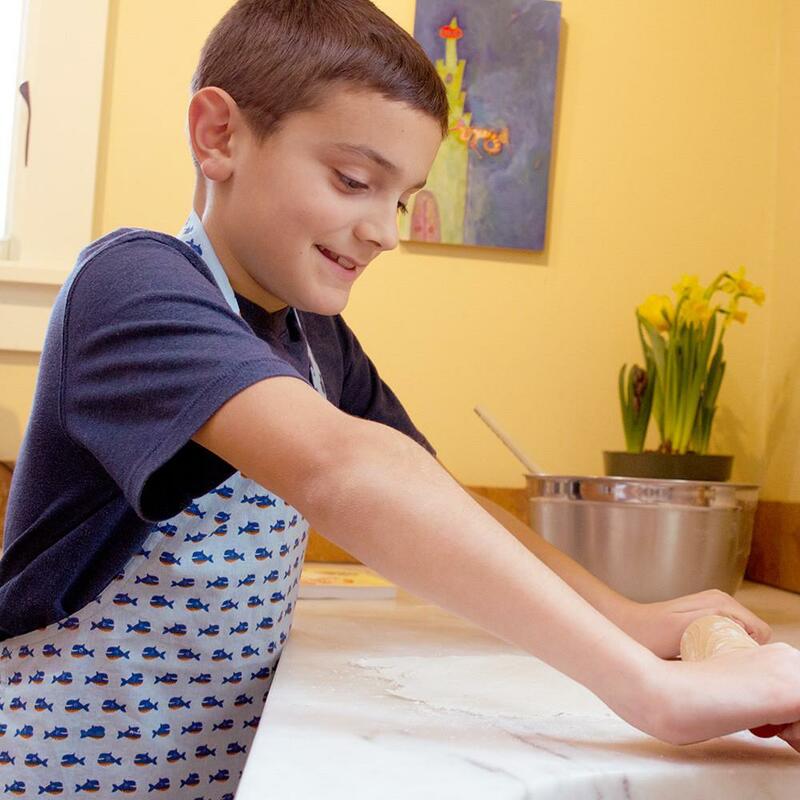 Through a combined tack of encouragement and observation, continue to include and challenge your child in the kitchen. Let them make the grocery lists and find recipes as soon as they have the urge; they may surprise you with what they can plan and implement as they move through their elementary years. As they take on some of the planning and cooking, be sure to teach the entire gesture- that cleaning is the rest of the cooking story. It will be in these years that you can address bigger topics like food waste, packaging, seasonality or frugality. So many of a family’s values are reflected in their choices within the kitchen that your actions will clearly model what you most want to teach. Whether you avoid particular foods, shop for local or organic ingredients, shun excessive packaging, or choose only natural cleaning products, it will all be evident in the shelves of your pantry or refrigerator. The way you all interact will show your child how to deal with the worst moments of a regular day, like when everyone is so hungry and tired and dinner is still 20 minutes away. Not only do the adults teach children how to handle everyday stressors, they also nurture the family bonds. Every time we work together, we’re showing our children what family means to us.